Been trolling theatre ads again, a habit ingrained since kindergarten (I used to paste them on the front of the family hi-fi ... what sense did that make?). Each tell a story, no two are alike, and there's not a better indicator of selling policy in towns small or big. Speaking of which, the mid-west Mystic wish-fulfilled 1935 patrons by hosting the alleged still living badman Jesse James four times daily at fifteen cents tops (Bob Ford having back-shot him was the bunk). Would you pay a nickel times three to see Jesse finally emerge after hiding out fifty-one years? I'll say I would! Depression rurals revered bandits among them, finding much to admire in John Dillinger, Bonnie and Clyde, others. Were movies (specifically newsreels of the day) to blame for making folk heroes of such criminal element? No telling how many ersatz Jesses toured through the first half of the century, each answering a need folks felt to reclaim the bandit what make chumps of still hated banks and railroads. (Long) before there was football on television, the only way you'd catch grid action was on movie screens, and games rousing wide enough interest might even merit top-of-bill placement, as here. I dug around the net for data on the Chateau's featured Minnesota-Washington match-up, a hotly anticipated clash for sure, as Minnesota had gone undefeated for twenty-four games prior (back-to-back national titles in '34/35) and Washington was regarded as formidable. Here was a contest worthy of two reels commemoration, sport mavens having pored over the weeks' newspaper details of the Golden Gophers (Minnesota) victory. And Last Of The Mohicans turned out to be pretty good for a chaser. Might have been fun at that to watch football highlights in a crowded house, even if I never bothered over the game beyond catching ends of televised fourth quarters to see if Charlotte's Channel 9 might fill in the last hour's balance with a Laurel and Hardy (which often they did). Well, here it is 1950 and we're still chasing pigskins. "Big-Screen Theater Television" was oft-rival to the free box at home, but suffered grievous in comparison with crisp 35mm projection. Customers wondered why images looked so rotten, gripes frequent enough to doom wide-spreading of TV in auditoria. Large-screen sets have only recent achieved quality-enough levels to compete with theatres, reason why so many have settled permanently at home to watch movies (me included). Once again, film noir we call classic fills a crowded bill to first-run patronage, this time in Chicago. Minus a first-rank star lead, thrillers like Panic In The Streets needed at least a co-feature to sweeten pots. 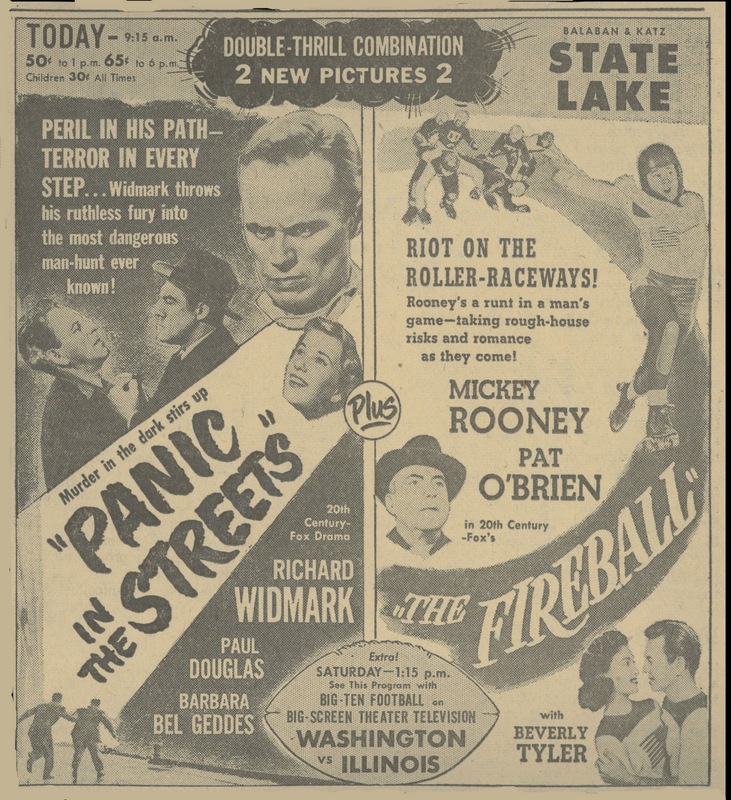 Here it's football plus on-the-fade Mickey Rooney in another of his independents, The Fireball, supplied by distributing 20th Fox to prop up Panic, the latter ultimately leaving $312K of Fox's red ink in the streets. 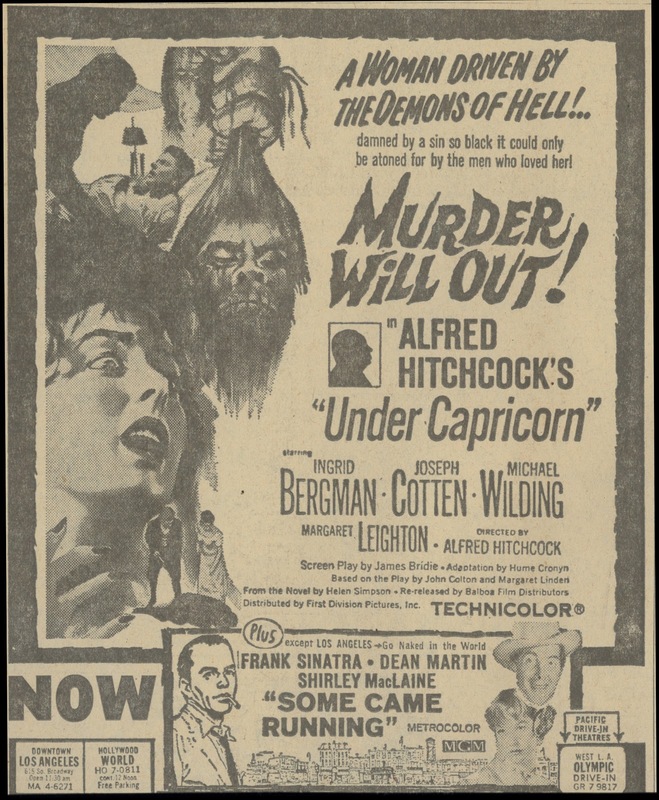 Here's a fairly nutty early-60's bid to recover some of the loss from Alfred Hitchcock's circa 1949 Under Capricorn. You'd figure the title was "Murder Will Out" short of closer perusal, this being, of course, the merchandiser's whole idea. But note smaller print ... the distributor is "First Division Pictures, Inc." of a re-release "by Balboa Film Distributors." Quite a thicket so far as rights-holding. Of all matured Hitchcocks, Under Capricorn is the one we see least nowadays (there was a DVD from Image in 2003). Wonder if Ingrid Bergman enjoyed being tendered as "A Woman Driven By The Demons Of Hell" (though some would say Rossellini was nearly that). This ad being for a Los Angeles engagement splashed all over their papers, there's at least possibility she came across it. As to money's worth or not, I'd have gladly sat for Under Capricorn plus Some Came Running even at risk of a numbed rear-end resulting from the bill's 254 minute run time. The Joie was an Arkansas house, tucked the Lord-knows-where in 1933 backwoods when Disgraced! arrived to afford glimpse of high and low life urbanites knew. How many locals would have gladly traded ginghams for chic outerwear such as Helen Twelvetrees dons while sipping precode champagne with Bruce Cabot? 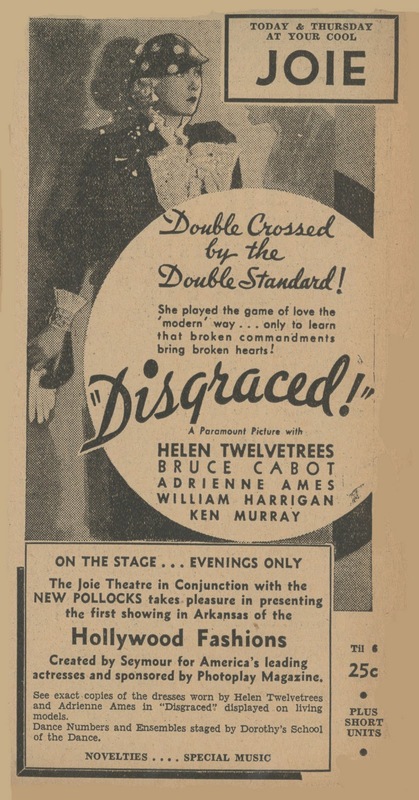 "Double Crossed By The Double Standard" was effective bait for the hook wherever you dropped it --- makes me want to see Disgraced! right now (but where?). The Joie's stage show is the ringer --- a Hollywood Fashion Revue tied in with a local clothing merchant and Photoplay magazine to display "exact copies of the dresses worn by Helen Twelvetrees and Adrienne Ames ... on living models." All this plus recital staged by presumed local "Dorothy's School Of The Dance." A quarter bought the whole show before 6:00, a whale of a bargain today, but less so perhaps in Depression-socked Arkansas where as much would have near filled a bag, if small, of groceries. Finally, another bid to pry patronage away from televisions. This was early 1951 and every effort was made to differentiate moviegoing from the home-viewer experience. The social aspect of theatre patronage was now being emphasized. Be A Part Of It! 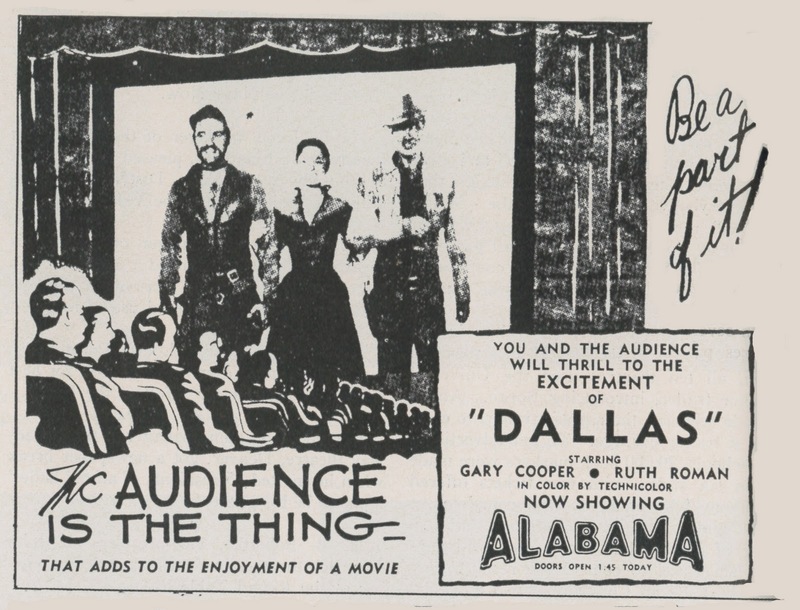 After all, The Audience Is The Thing That Adds To The Enjoyment Of A Movie. We know there's truth in that, having watched favorites in solitude and with a crowd. The crucial difference between us and those of Golden Age attendance was fact they saw nearly everything in groups, often as not large ones. My encounters with Dallas (a favorite) have been lone from the beginning. How much more would I enjoy it with eight hundred folks sharing? We imagine having it made with DVD and streams off the Net, but I'd trade all that to walk into packed sites of yore where these pics really came to life. 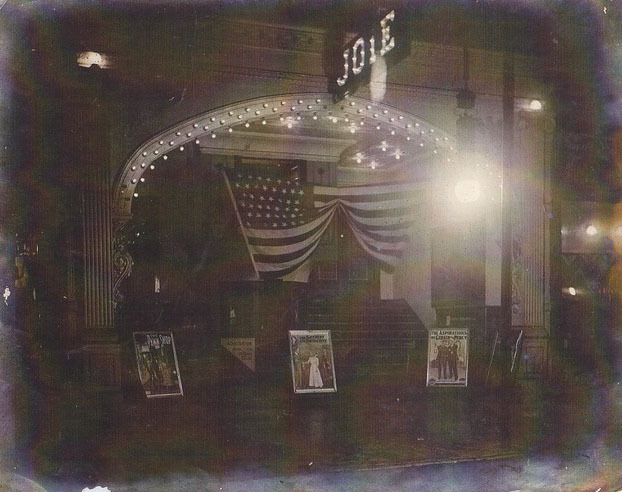 (4/7 --- 12:50 pm) Reader Allen Hollis just sent along the above photo of the Joie Theatre, 1933 host to Disgraced!, along with explanation of its whereabouts and further info: The Joie Theatre was in Ft. Smith, AR and lived from 1921 to about 1954 when a fire backstage ended its life. Though locally owned most of the time, Malco Theatres operated it the last five years of its existence, it was part of the Orpheum Vaudeville Circuit in the 20’s and also had stage shows in the 1940’s, but was a first class, first run theatre through the 30’s and 40’s. Thanks a lot for the image and data, Allen! Having watched "Under Capricorn" while dining on bbq ribs and beer, I'd say, like "The Paradine Case," "Stage Fright" and "I Confess," it's rarely seen for a reason -- it isn't very good. Unlike Hitchock's many classics, the above movies vanished from my memory the minute I turned off the TV. And call me a hermit (I've been called worse), but I'd rather see a movie at home on a pristine DVD than in an overpriced, noisy, distracting theater. We started a new fanzine and would really appreciate if you can add us on your bloglist. In the future days we will publish an interview with Fred Vogel (August Underground) as the first post. You blog is already added on our blogroll. Thanks! The picture of the small, dark, Joie Theater is of the 1st Joie Theater that was on Garrison Avenue in a converted commercial building until the early 20s when a new Joie was built on South 9th street. It's the one that burned in the 50s. Early 60's: The Big movies would open in San Jose and ever so slowly work their way down to the Granada in nearby Morgan Hill, where they'd play for one weekend max. The Granada put out a monthly flyer with the double features for each weekend, often a Big movie paired with a late-period Universal programmer ("King's Pirate"); sometimes a movie that had already appeared on TV. I remember them as being on colored paper with halftoned pressbook ads, with occasional hand-lettering ("Thu-Fri-Sat; No Passes; Plus Cartoon"_ Our vicar noted with a little amusement that one month's flyer came to him with a little apology from the owners written on the back -- it was a bad month for family films. That old man appearing at the Mystic as Jesse James is a glimpse of how the vaudeville and movie houses competed with each other through the 1920s. Vaudeville was live entertainment, but vaudeville bills increasingly offered various movie short subjects. The distinction, of course, was that the movies couldn’t talk or sing back then. In response, many movie houses, especially in urban settings, offered their own live acts. It was expensive, though, and the Warner Brothers backed Vitaphone essentially to provide a vaudeville bill for their theaters at a fraction of the cost. Many vaudeville stars allowed their acts to filmed, thus hastening the demise of vaudeville, when the much greater exposure offered by the movies removed any need to pay more at a vaudeville house for the same thing or, worse, to see less than stellar talent. Acts that had been developed over years were killed for a one-time payoff, though having seen some of the acts captured by those Vitaphone shorts, I have to wonder whether it was really in the nature of a mercy killing. When New York’s premier vaudeville house, the Palace, went to a movie program in 1932, vaudeville was dead. 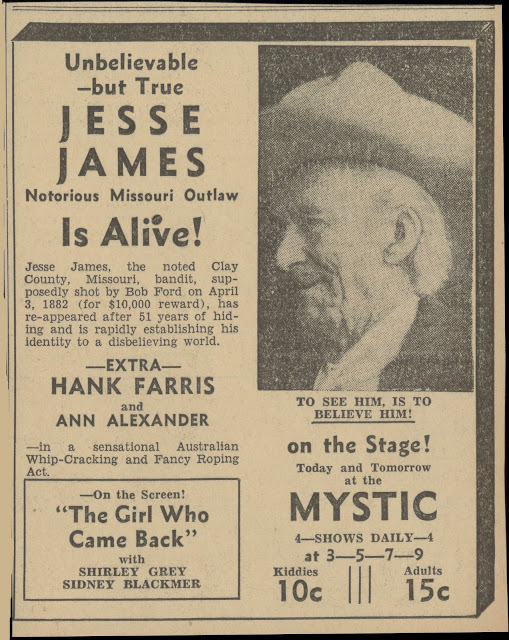 The movie houses, however, continued to offer live acts, including such marginal entertainment as “Jesse James,” but also former vaudevillians who couldn’t make it in radio or the movies, like that Australian whip act. Some of the acts were of a higher class, however. My mother, who grew up in Gary, Indiana and was 20 years old in 1945, would go with her sisters and friends to Chicago to spend an afternoon at one of the downtown movie palaces, like The Chicago, the Roosevelt, the Oriental, or the Regal, walking through the faux-marble loggia to take in a short subject, a cartoon, a newsreel, and the featured film, but also a name band like the Bob Crosby or Gene Krupa Orchestras, a dance troupe, or a movie star making a personal appearance, and all this in air conditioned comfort. Vaudeville had generally taken a break from the summer heat. I think I understand the bug for digging through newspaper ads. I used to climb over the chainlink fence at the local dump at night, armed with scissors and a flashlight so I could cut movie ads from the stacks of Washington DC newspapers piled up near the gate. They were mostly leftovers ditched by deliverymen who couldn't move them from their street vendor machines, so I was able to get multiple copies of prized adverts (monster movies of the 1970s). Since I rarely got to enter a movie theater at all, cutting out and studying the newspaper ads was the best I could manage. For some reason, finding the screening times also helped since it told me how long the films ran, which knowledge I would then use to fill in with whatever storyline I could surmise from the adverts.